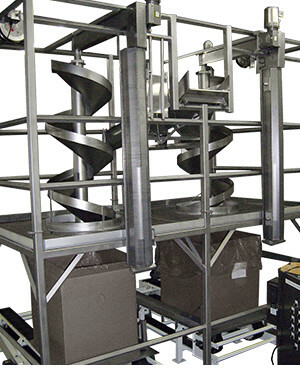 Reduce product damage and improve product appearance with our Retractable Smooth-Flo Spiral Chute. This unique device was designed to gently fill bulk totes, while never dropping product more than a few inches as it retracts upward, filling the tote as it rises. The process begins by lowering the Retractable Smooth-Flo Spiral Chute into a prepositioned tote. Product is then transferred from your conveyor onto our infeed chute, which directs it into the Retractable Smooth-Flo Spiral Chute. As the tote starts to fill up, a product level sensor detects the level of product in the tote. This directs the speed of the spiral rising out of the tote, programmed for a slow, gradual lift, so that products are never dropped into the container from a height of more than a few inches. These unique design features help reduce product damage and improve finished product appearance.